I wanted to do something with bone sprinkles this Halloween, and decided that a skeleton pinata cookie would be a perfect fit! 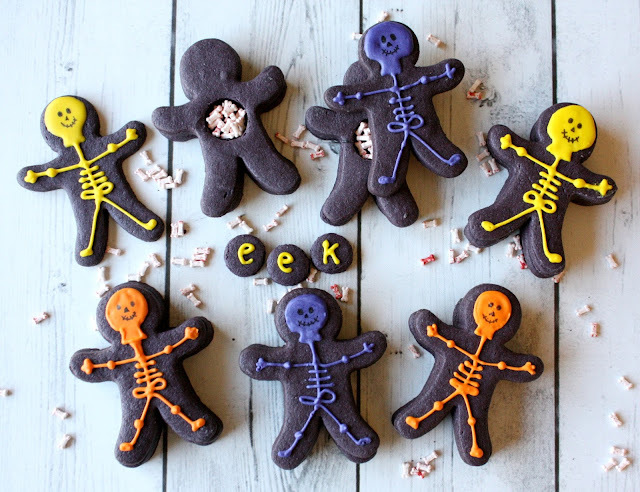 These cookies are fairly simple to make, but each cookie does require three skeletons. I rolled the dough out to about 1/4-inch thick, which is about half the usual thickness, so that the triple-layered treat would not be overly thick. I didn't need too much royal icing because I did not ice the base of the cookie, just the simple skeleton design. The cookie dough was colored using black gel paste. Once the cookies are baked they come together lickety-split! 1. Mix the cookie dough in a stand mixer, adding the black food gel until well blended. 2. Cut out cookies (Note: 3 cookies are needed for each cookie stack), place on baking sheet and bake according to recipe. 3. While the cookies are still warm (soft), use the small round cutter and make a hole in the middle of 1/3 of the cookies (see photo above). 4. Using a decorating bag and a #2 tip, decorate a 1/3 of the solid cookies with a skeleton design out of tinted royal icing. 5. Let cookies dry for about an hour. 6. Apply black royal icing to the back edges of the cookie with the hole and place it gently, but firmly on a plain, solid cookie (try to match up the cookies that stack most evenly together). 7. Fill the hole with bone sprinkles. 8. 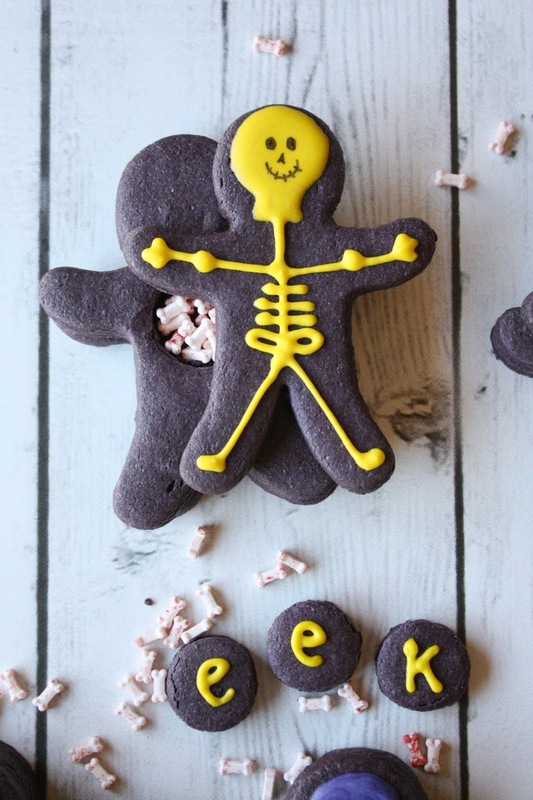 Apply black icing to the back edges of the cookie with the skeleton and place it on top of the bone-filled cookie. Let dry. I think my munchkins will have fun with these, and yours will too! So cute! And love the icing colors too. Perfect for Halloween! Totally adorable and just the RIGHT cookie for the holidays, Sue. Glad you like them Angie; Thanks! I'm not much on really ghoulish-looking food either, but I think these cookies strike a nice balance. So fun to find the surprise inside!